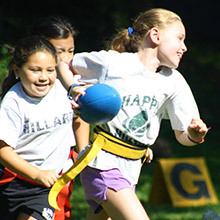 Here at Camp Hillard we take great pride in our 91-year history as a leader in sports skills development. Our winning formula is a result of excellent instruction, quality of our facilities and the variety of sports offered. Each day, our campers are developing their athletic skills in a positive and healthy setting, where fun and learning go hand in hand. The improvement of sports skills is fostered through lots of encouragement and individual success. Campers receive excellent instruction in the proper fundamentals in each sport from an exceptional team of experienced individuals comprised of some of the finest coaches in the area. Our program is built around success so whether your child is a beginner, intermediate or more advanced they will thrive. Our goal is always on skill development but with a priority on safety, fun, and teamwork. The variety of activities includes: soccer, softball, basketball, baseball, field hockey, street hockey, lacrosse, flag football, gymnastics, tennis, pony rides, archery and the batting cages. Campers also participate in miniature golf, horseback. golf, boxball, ga-ga, group games, new games, newcomb, volleyball and capture the flag. Boys and Girls entering 1st grade and older are participating in sports leagues, sports challenges and tournaments. Boys and Girls entering 2nd grade and older participate in more advanced clinics, sports leagues and sports choice periods, and have the opportunity for additional instruction in Tennis, Gymnastics, Horseback, Golf, Basketball, Baseball and Soccer. 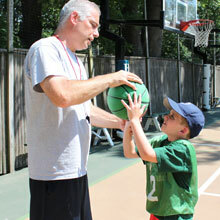 Once Campers enter the 3rd grade and older they can choose to participate in our Sports Specialization Programs. These programs allow our older campers to spend more time focusing on advanced skills and game play in a sport of choice. 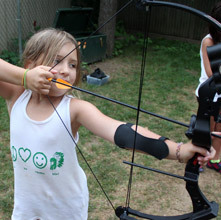 Archery is popular for boys and girls entering 2nd grade and older. Our archery targets are set at an age-appropriate distance and we use specially designed bows that allow for lots of success. Basketball is one of our most popular sports at Hillard. The program focuses on teaching the fundamentals of the game. Our facilities include 6 outdoor courts all with adjustable height baskets allowing success for all ages. Specifically our campers are learning shooting, passing, dribbling, defense and offense. We utilize mini, junior or intermediate size balls depending on the age and the skills being taught. Our philosophy is everyone makes a basket at Camp Hillard! Our adjustable height baskets allow campers to achieve success, and learn proper shooting form for various shots at challenging heights. As campers get older they have opportunity for more basketball through choice periods, league play and our sports specialization basketball program. Our baseball and softball programs are built around teaching the fundamentals, rules of the game and success. We use specially designed training equipment that is age-appropriate for each division of camp. We also incorporate live pitching for all ages in camp and only utilize batting tee's to teach mechanics or when appropriate. Our sports staff is trained to properly pitch the ball to the right spot so that each camper is having success! Junior Camp utilizes specially designed equipment including safety balls, bats and gloves. Middle campers learn with light weight aluminum bats, proper sized gloves, safety baseballs and softballs. Senior campers progress to more advanced equipment including larger bats, gloves and bigger fields. The girls play with training softballs and the boys play with training baseballs. Boys and Girls entering 1st grade and older have the opportunity to participate at our batting stations. This unique training facility allows our campers to improve their grip, stance and hitting mechanics such as eye-hand coordination, bat speed and most importantly a level swing. As campers get older they have opportunity for more baseball or softball through choice periods, league play and our sports specialization baseball and softball programs. Flag Football is fun for all ages. Depending on age and ability, campers learn the fundamentals of throwing and catching. We utilize foam, mini or Jr. sized footballs depending on age and the skills being taught. Campers master the basics and progress from beginning pass patterns to fundamental techniques of offense and defense skills. This is complemented by plenty of game play and lots of scoring! Located in our 3,000 square foot Gymnastics Pavilion. 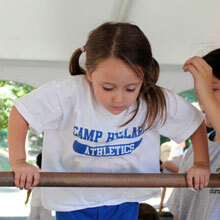 Campers are given instruction in the various events such as balance beam, even and uneven parallel bars, low bar, vaulting, floor exercises and tumbling skills. Our program also fosters physical development on apparatus such as horizontal and vertical ladders, rings, ropes and tumble track. Campers entering 2nd grade and above are offered the opportunity for additional instruction during weekly Individual Activity Choice. All equipment is scaled down for each age group allowing our campers to learn the sport of gymnastics safely and correctly. Campers focus on the fundamentals learning dribbling, shooting, passing, goaltending and progress to basic defensive and offensive plays. Game play is highlighted with lots of action, learning rules of the game and an emphasis on proper spacing. Junior campers play softee hockey with big foam yellow and blue sticks and foam balls, and Middle campers progress to molded orange and yellow foam sticks and utilize whiffle and safety rubber balls. In Senior Camp the boys play street hockey with official sticks, helmets, gloves and knee padded shin guards, and the girls play field hockey with rubber J sticks and safety rubber balls. Lacrosse is offered for boys and girls starting at 7 years old and up. Utilizing 33 inch sticks, gloves, goggles, and safety balls, campers learn how to throw, catch, and cradle a ball. In addition, we introduce modified games that help to reinforce the skills learned. 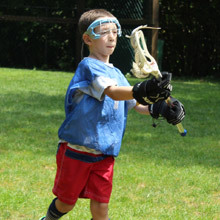 Senior Campers during sports choice can also choose to play box lacrosse. Our soccer program focuses on improving the fundamentals of dribbling, shooting and passing, positioning and rules of the game. Junior and Middle camp practice with a size 3 ball while senior campers practice with a size 4 and size 5. Each lesson focuses on teaching success which help to build skills and make it fun! 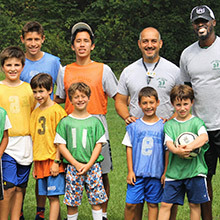 As campers get older they have the opportunity for more soccer through choice periods, league play and our sports specialization soccer program. This program is an enhancement to our already strong sports program for boys and girls entering 3rd grade and older. It's a hybrid between specializing in a sport of choice and participating in the traditional camp program. It's a great choice for those campers looking to improve for their recreational or travel teams! The boys have the option of specializing 3 full mornings a week and the girls 2 mornings a week in the core sports - soccer, baseball, softball and basketball. This program, led by some of the finest coaches in the area, focuses on advanced skills and game play. In the afternoon, campers participate in the regular camp program. Learning tennis at Camp Hillard is fun. Individual and small group instruction is scheduled weekly for all ages. We incorporate the USTA 10 and under tennis skills along with the Camp Hillard stroke development program. Campers entering Nursery and PK are learning introductory skills. Campers entering Kindergarten participate in our Mini-Tennis program; using properly sized equipment these campers learn to master the main skills of the game. Entering 1st graders and older play on our larger courts and focus on stroke development, footwork drills, rally progressions, games and good sportsmanship. Campers entering 2nd grade and older have the opportunity for additional instruction during weekly Individual Activity Choice. Entering 3rd graders and older participate in more advanced clinics and tournament challenges.